There was an insightful interview with him in Singapore newspaper – The Straits Times, 15 Aug 2008. The theme of that interview was on education; including the topic of having meritocracy in Singapore’s education system. As I have kept that interview, I would like to share some interesting parts from there. “… You have Raghuram Rajan, the former chief economist of the International Monetary Fund, saying after 50 years we still do not know how to promote virtuous circle of development in developing societies. After reading that interview, I came to conclusion that he must be a strong advocate of MPH (Meritocracy, Pragmatism, Honesty). He may be critical but is also full of optimism (something that I decided to cultivate in my mindset after reading his interview) whenever he views issues in societies. It is also interesting to note about how he broke out from his humble background, where the father was a salesman and the mother was a housewife. A family of six of them lived in a one-bedroom terrace house. He was the first among his cousins to enter university. And he highlighted that he was able to do so because of Singapore’s meritocratic education system – he obtained President’s scholarship to study in a university. Though I have no idea who you are or what you are, I would like to express my heartfelt gratitude for all of your very valuable and insightful comments, Sayama Thin Thin. I came to know the word “meritocracy” for the first time in my life only when I read his book. And his MPH idea has had great influence on me since then. And his background, written somewhere in one of his books, is, as you said, very interesting and above all, inspirational, at least for me. Thank you again, Sayayama–this time on behalf of the readership. ေျသာ္..ဒုတိယပိုင္းဖတ္ျပီးမွ သေဘာေပါက္ျပီဆရာေရ..တူရကီမဟုတ္ဘူး၊ တရုတ္ကိုေျပာတာျဖစ္မယ္။ chinese ဟုတ္လားဆရာေရ..
For your above comment: no problem. I am more than happy to be able to share something with other readers. Frankly speaking, I am not so much a fan of translated literature as I value the essence of originality. However, just recently, I read translated books by well-known Japanese authors such as Haruki Murakami, Yoko Ogawa and I came to realise that without these translated versions, I would never have had a chance to savor such brilliant writings. In addition, some Burmese friends told me that they came to know about famous authors such as Leo Tolstoy, Antoine Desainte and their books because some authors translated those into Burmese language. So now, I begin to see the great value in having Burmese authors translating these wonderful books for Burmese people to read. Without a doubt, I think, translating a book is not easy. You have to consider about the right words to use so that there is a smooth flow in the writing and the original flavor is maintained, etc. Just a request: I would be very much grateful if you could share with us about the considerations that you have to keep in mind when you translate a book and how you go about doing it. Based on your previous posts, I think you are an avid reader as well. I would like to recommend the following non-fiction books. You may consider them for translation into Burmese. ===> This is quite an old book. However, it is fascinating to learn about some personal aspects of one of the well-respected leaders in the world, what made him to be who he is today, what did he have to go through before he became who he is today, etc. ===> He has written quite a number of books and I think all of them are pretty well-received though some critic raised some issues with the credibility of the things that are mentioned in his books and also, the lack of detailed referencing. Nevertheless, I like reading his books as the way he collates all those ideas together and form a certain conclusion out of it, seems rather refreshing and interesting to me. It’s very funny for me to have become a translator of some books because I am not so much a fan of translated literature, too, and haven’t read more than a couple of books translated into Burmese. I love reading and after having read some good books I feel like sharing it to Burmese readers and that’s how I become one. To tell you the truth, I have no particular considerations whatsoever when I translate any material. I have been writing since I learned to write and hence it has become a part of me. However I have lots of dictionaries around me, in addition to four different kinds installed in my computer, and when it comes to new words I usually take a certain amount of time to choose the most appropriate word in Burmese. I have Lee Kuan Yew’s book, but haven’t read it yet. 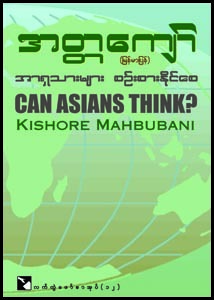 It has already come out in Burmese, translated by another writer. I have heard of Malcolm Gladwell but never had a chance to flip through any of his books. I will keep your advice in mind. Currently I’m translating “A Fortune-teller Told Me: Earthbound Travels in Asia” by Teziano Terzarni, the late Italian journalist. I am also going back to fiction these days and enjoyed both books of Khaled Hosseni. I felt like translating the Kite Runner, but again the Burmese translation of another writer has recently come out and I am glad for Burmese readers. Very recently I read a book of Aravind Adiga called “The White Tiger.” It was really a good read and I have been thinking about translating it. Just thinking in the meantime as I am now far busier than a bee with other engagements. Thank you very much again, Sayama, for your kind advice and comment. Appreciate your sharing regarding your way of translating a book. “The Kite Runner” is one of the brilliant books that I’ve read. I love everything about it: the plot, the writing style, the skillful portrayal of each character. I was told that his second book – A Thousand Splendid Suns – is also very good. I haven’t gotten to reading it though. If you are into fiction and have a fondness for mathematics, I would recommend “The housekeeper and the professor” by Japanese author (Yoko Ogawa). I’ve heard of “The white tiger” but never got a chance to check it out. I will add the two books that you mentioned above, in my list of books to check out. Thanks for mentioning those.